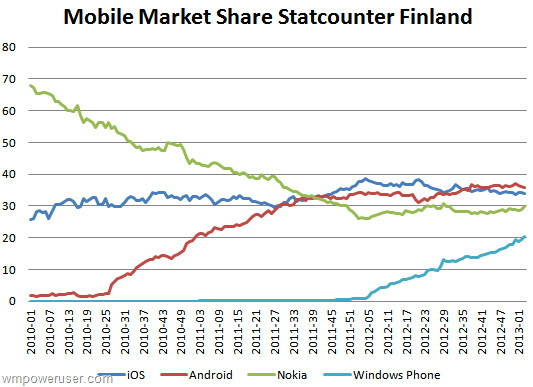 What might tickle Windows Phone users teal (the color of the platform on the graph) is that over the last few weeks, the market share on mobile browsers that Windows Phone has picked up in Finland has come at the expense of iOS and Android. The latter still has a small lead in the country with iOS second and Nokia third. You do! You commented! Thanks for playing! both BlackBerry and Nokia's Homeland (canada and finland respectively), they have super supporters there! nice to see that! I love Finland I Love my Nokia lumia 920. I love my NOKIA 8800 Carbon Arte and The N series!!!!!!!!!!!! you know thats 20% Windows. Not Nokia. Android is dominating worldwide, they don't nor are there any signs of concern for Nokia WP8 cause they are right at the bottom and always will stay there. They will stagnate with along BB, while Android then iOS will rule! Lmfao Android worrying about WP8, please they the world knows WP has been trying for 8 years and its failing! What a joke! There days are gone, its Samsung Apple HTC LG Sony Moto, its BB and Nokia that are in need of big help, and is dieing from peoples heart! I was a big Nokia SonyEricsson Samsung fan, but now Nokia have discontinued there N series and the ubiquitous 8800 series, how so sad. Sometimes I think its the other way around, considering how much on top sammy is. Android is on top and sammy has played the biggest part. Nokia are holding on to ms.
SS and Android need each other. But SS can't be nowhere nearly as successful w/o Android while Android can cope w/o SS with only minor problems. The key here is the Android ecosystem which GG controls while SS hardware is just on par with HTC, Sony... What SS does better than other OEMs is promotion, but look how much money MS and Nokia spent on ads. It shows that ads won't work w/o a strong ecosystem. That is great news! Go Nokia! From what i see is that there's a drop of ~5% (iOS) and ~1%(Android) from their respective peak positions so that's the max that Nokia gained from others if the graph is to be believed. Balance 14% is Nokia's other loss to windows ... again that's a presumption because from whatever anayltics data we see for sites of our clients (US/India) windows on mobile is averaging around d 3.5%. 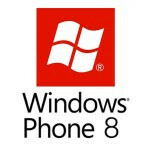 Windows Phone 8 is picking up traction in the European market now on the account of Windows phone price points. Its great to see Windows Phone market share increasing. I am still awaiting the Russian and Italian market!! Finland? Does that even count? So around 30-50 people switched over to WP, hoorah!